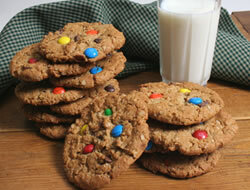 These peanut butter and oatmeal cookies will put a smile on your face. 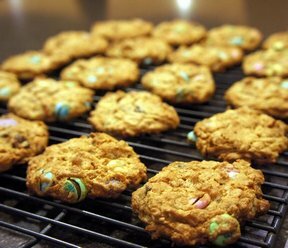 Instead of M&Ms, these cookies have bits of toffee in them for a delicious twist on an old classic. In a large bowl, cream together the sugars, butter, and peanut butter. Add the eggs, baking soda, vanilla, and corn syrup. Stir in the oatmeal, chocolate chips and toffee. 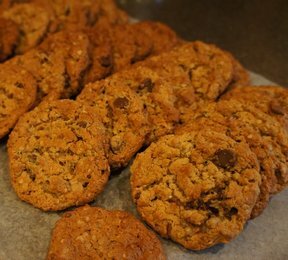 Place by the teaspoon on an ungreased cookie sheet. Bake at 350° F for 10-12 minutes. 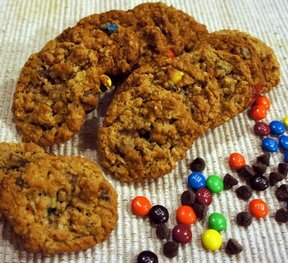 "I loved the addition of the toffee bits! I liked these way better than with M&Ms."